Duke-Mercer: Why it’s not that surprising when a small school beats the mighty Blue Devils in the NCAA tournament. It’s really, really great when a small school beats mighty Duke in the NCAA tournament, but it’s no longer that surprising. The Mercer Bears celebrate after defeating the Duke Blue Devils 78-71. It’s a bittersweet moment when Duke loses in the NCAA tournament. Yes, it’s thrilling to see Mike Krzyzewski go down, but it also means we have to wait until November for the Blue Devils to lose again. While we wait for college basketball’s powers that be to invent a new March Madness structure, one that allows Duke to suffer a devastating defeat, advance to the next round, then lose again in a never-ending cycle of shame, this is the best we can hope for. For the second time in three years, the Durham, N.C., basketball factory/leadership institute has lost its opening tournament game to a little-known school from an indeterminate location. In 2012, they fell to tiny Lehigh. This year, it was the Mercer Bears who slew the Devils, pulling away late to earn a 78-71 victory. The most surprising thing about the final score was that—in both a micro and a macro sense—it really wasn’t that surprising. Before the tournament began, Krzyzewski whined that the Atlantic Coast Conference should “get more respect” from the NCAA selection committee. He should’ve been stumping for the Atlantic Sun. The conference that brought us Florida Gulf Coast’s Sweet Sixteen-bound Dunk City squad in 2013 has now furnished us with this year’s excellent Mercer team. While FGCU turned basketball into performance art, Mercer—which is in Macon, Ga., by the way—doesn’t transcend the game in any way. Rather, the Bears are constructed in the small-school-ish fashion that’s traditionally led to tourney success: They shoot a high percentage from the field, and they’re very experienced, starting five seniors. The bigger picture here is that college basketball has become bifurcated, with major-conference schools fielding more-talented, less-experienced rosters than their small-time brethren. Duke has succeeded in the one-and-done era by recruiting the kinds of not-quite-superstars who stick around college basketball for three or so years. But the Blue Devils program is more Calipari-ish in its reliance on young talent than you might think. Duke’s rankings in on-court experience since 2007: 331, 295, 161, 69, 199, 223, 158, 279. 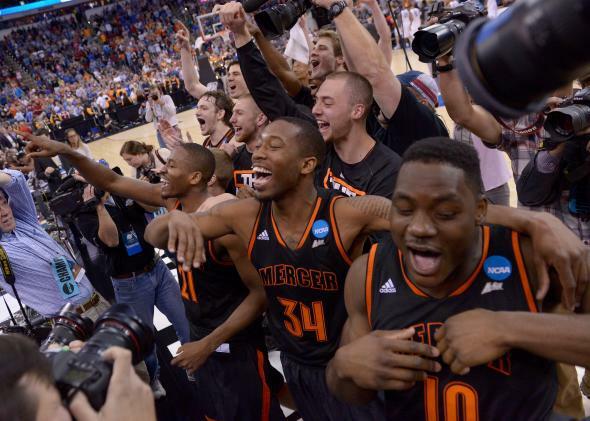 Down in the bottom rungs of Division I, Mercer and its ilk spend years building a squad, then bring it to the NCAA tournament when it’s ready to flourish. According to KenPom.com, the 19 most-experienced teams in the country (six of which made the tournament) come from outside the sport’s power conferences. Among the country’s least-experienced rosters are schools with a combined 29 NCAA championships: UCLA, North Carolina, Arizona, Michigan, Texas, Kansas, and Kentucky. Friday’s Mercer-Duke game was almost an exact replica of Thursday’s biggest upset, in which the North Dakota State Bison (20th in the country in offensive efficiency, 23rd in experience) beat the Oklahoma Sooners (84th in defensive efficiency, 305th in experience). These two victories don’t mean that the small-school approach is superior (or that all power conference schools play horrible defense). Both games were close enough that the outcome could’ve swung either way, which is kind of the point: a completely unequal system has created a perfect equilibrium, one in which David sees eye to eye with Goliath. In the past 10 years, Duke has made the Final Four once and lost its first NCAA tournament game three times, with all three of those losses coming to schools outside the biggest leagues. (VCU and Eric Maynor took down the Devils in 2007.) Actually, that’s the perfect equilibrium: So long as Duke gets humiliated three times more often than it reigns victorious, I think we can all agree that college basketball is working beautifully.